About Energy Diamond, The company behind Social Vitamins. Be profiled and matched to people you Learn from as well as 'Like'. Build an empowering and stimulating support network for your Personal Life, Work or Community. Discover and fulfill purpose in your Life and help others unfold purposeful lives in the process. Create an Atmascape chart to visualise how effectively you are learning to meet your potential while helping others with theirs. As challenges and opportunities arise in your life complete a daily Atmascape to become aware of what life changes you need to be mindful of. How do you get the most from your current social circle and manage it so your life is happier and others get a lot from you too? Social Networking is not just about telling people about your day or publicity. It can, with the right add-on, be used to facilitate mutual learning and growth to build yourself a personal life support community. The healthiest social circles a person has usually consist of a mix of people that are similar, complementary or opposite to them. These kind of people are 'Social Vitamins' that support you, help you process what happens in your life and also challenge or stretch you. Connection to these ‘three a day’ social sources ensures personal growth, emotional intelligence in relationships and a natural inclination to be of service to the person’s community. The more variety a person has in their Social gene pool the more growth and happiness they will have the possibility to experience. Different wants and needs are served through different types of social relationships. How well people are meeting their needs while getting what they want defines their happiness. Conflict though between what you want and what you genuinely need can create stress and affect health and wellbeing. Hanging out with people who are similar to you could lead you to having fun but due to shared shortcomings lead to little growth. People who are opposite to you may challenge you and stretch your growth but it might not be much fun. So whats the best mix for a vibrant social life that you grow from and contribute to? Jazz Rasool from Social Vitamins parent company, Energy Diamond, has done 4 years of research into personal development and Social Networking to discover how people go about getting what they need and what they want and which strategies seem to make people happy and in a state of ‘flow’ with their life’s direction and purpose. The outcome led to software that could profile people and disccover who had a social learning style or 'Social DNA' that was similar, opposite or a mix to the person being profiled. Jazz took the new Social DNA matching software and used it to track how well people are meeting their needs and let them link them to others who they could create a mutually supportive network, a key component of Happiness and Wellbeing and vibrancy in a Social Networking. Social DNA evolved from software that profiled a persons sense of purpose and what they were being good at being mindful of in life. Social DNA was built from map of a persons purpose and mindset called an Atmascape. Atmascape and its core software were developed by Jazz after his research with hundreds of coaching and mentoring clients looking to get clarity about their life purpose and what factors of their mental outlook were getting in the way. Clients using the Atmascape maps of their purpose and mindset reported on average that they were 84% accurate and powerful in the mentoring that followed to help them to move towards their purpose. This research created an extensive evidence base that showed clients gaining self-mastery as well as mastery that could be passed on to others. Jazz is a Coach and set up Energy Diamond Consulting after many years experience in high-level executive coaching. Jazz currently works with the Global Institute for Extraordinary Women (GIFEW) where women executives apply Energy Diamond approaches in their practices and businesses, especially in helping clients with their goals and energies. Although Jazz was creating elements of Energy Diamond as far back as 1989, he organised the Energy Diamond components into a holistic system of coaching in 2005. From 2002 his work led to new best practices in Stress Management and Performance Coaching that were applied at the HELP counselling centre in London run by Richard Branson's Virgin Unite Foundation. He also worked with diplomats and executives at the United Nations in Switzerland, with celebrities in Hollywood, executives and staff in BT and with the board and international directors of Unilever at their Vitality themed Rebranding in 2004. In 2000, after training with several Masters in Chinese Medicine and Martial Arts, he went on to train existing practitioners into fully fledged instructors. A strong focus developed in treating patients with stress and hormone related disorders as well as clients with issues around motivation and empowerment. Jazz graduated with a degree in Physics in 1992 and a Masters degree in Molecular Biology in 1993, both from the University of London. He went on to teach for many years on the physics behind mind-body medicine and the biology of the human mind, delivering training in Europe, the USA and the Carribbean. Jazz was born in 1966, in a village in Pakistan not far from the Himalayas and has lived in the UK since 1970. Example of an Atmascape visually showing someone's mindset. learning to meet your potential while helping others with theirs. You can get get a sense of your purpose and the mindset you are working with by getting your own Atmascape by registering and completing a questionnaire on how you are learning in life. 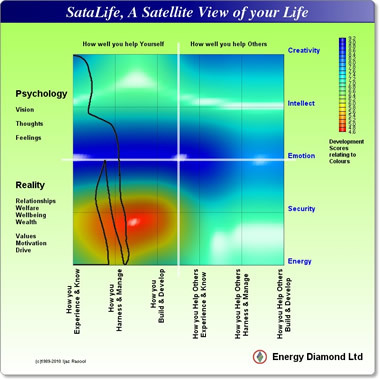 Get a satellite view of your life and see the emotional intelligence with which you are meeting your life’s needs. An Atmascape is a visualisation of how effectively you are learning as an individual and how effective you are in helping others. When answering the Questionnaire you will give different ratings for how well you are doing for different areas of your life. Your scores can be put into a table or grid as in the image above left. Then, in a 'paint by numbers' way, your pattern of scores are converted into an Atmascape colour map, above right, that shows where you strengths are and where your undeveloped areas of your life are. Its even possible to see where you may have a habit of doing things repeatedly if white areas show up on the map. 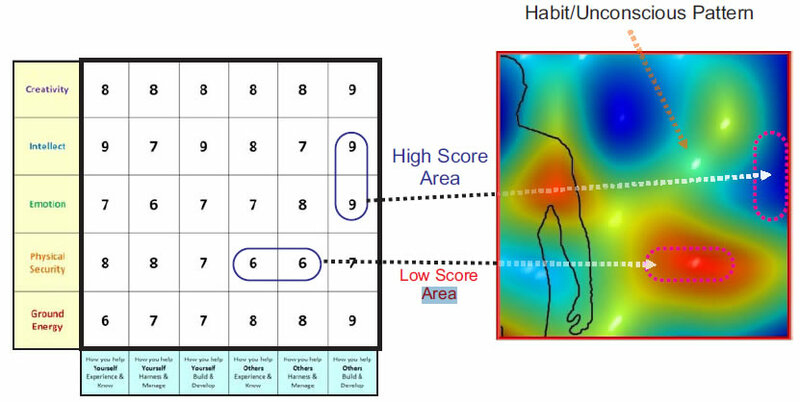 Habits in high scoring areas are usually good habits wheras habits in underdeveloped areas are probably getting in your way. You can compare your Atmascape with others using Social DNA Resonance Matching to get lists of people that are Similar, Complementary or Opposite to your Life's journey on that day. People change every day so you’ll be shown who is best to connect with on each day so that you can interact with people to have the most learning, fun and growth with. In recent poll it was found that when asked which type of friends they had the most of, most of the people surveyed answered that majority of their friends were complementary and few were completely similar or opposite to them. After the SocialDNA software generates your three lists of people that are similar, complementary or opposite to you, you can then connect to people via their social networking links or simply send them email message to start an interaction for learning and growing with them. Rate and filter people by how much resonance you have with them and bookmark your favorites. Learn to get on with others using our approach to collaborating. Start to find others you could learn from and who might even learn something from you. Get your own Atmascape by registering now and follow that up by trying out the Social DNA matching to discover people to build a support network with for your life.